Akai's latest look great but how do they sound? 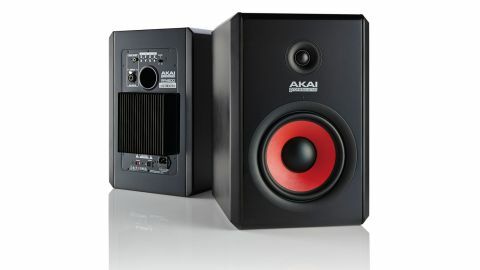 Akai have delivered a set of monitors that offer plenty of bang for the buck and look good too. Striking looks. Flexible tonal adjustments available. Plenty of volume when needed. MF boost is perhaps a little harsh. Akai may be better known for the likes of its MPC sampling workstations but the company actually has quite a large range of professional music-making gear that continues to expand, evidenced by its new controller keyboards, drum machine and synth on display at the NAMM show in January. The RPM800 powered studio monitors were first announced back in 2013 alongside the smaller RPM500 (£145) with a bunch of press pictures showing them as having striking red cabinets. "With their striking finish and colouring, these monitors will make a visual impact in any studio, but they are not just about looks"
Sold separately rather than as a boxed pair, the RPM800s, at around almost a foot wide, 17 inches tall and 15 inches deep, will take up a fair bit of real estate, so are not for small rooms. Wherever you choose to place them, though, you can eliminate any structural borne resonance by sitting them on the included isolation pads. With a triumverate of input options in the form of XLR, 1/4-inch jack and RCA phono sockets, you'll have no problem interfacing them with a variety of equipment. Bi-amped, an RPM800 has 120 Watts of Class A/B power in the form of an 80 Watt amp driving the 8-inch woofer and a 40 Watt amp driving the 1.25-inch silk-dome tweeter. Around the back there's a flared rear-firing bass port so you probably wouldn't want to place the cabinet too close to a wall (Akai recommend at least one foot away). If that's not possible, there's the Proximity Control Switch which compensates for placement near walls with a shelving filter for frequencies below 200Hz. Besides flat, you get two settings, the -2dB setting being designed for use if the monitor is placed closer than one foot to the wall and a -4dB setting to compensate for corner placement. Another low-end tweak comes courtesy of the LF Cutoff switch which can bring in a 12dB/octave filter to roll off frequencies either below 60Hz or 80Hz. Its primary use is for pairing the RPM800 with a subwoofer that does not have a built-in crossover. For more fine-tuning of the sound, there's a HF Trim Switch to boost or attenuate the top-end over 3kHz by 2dB and there's an MF Boost switch that can bring in a midrange boost from 1kHz to 3kHz with a 2dB peak at 2kHz. Sited carefully and running flat, the RPM800s performed well across a variety of mixes. At everyday working listening levels the sound seemed nicely accurate across the frequency range with a good balance between the low-end, midrange and treble, and there's plenty of power there if you need to crank them up now and again. Stereo imaging was pretty sharp too, allowing you to make incremental panning choices with ease. As far as the switchable adjustments went, we found the MF boost perhaps a little harsh but could hear the merits of the HF trim, the general opinion being that it's better to have options available than not have them, especially the Proximity Control which sorted things out nicely when we did place the cabinets against a wall. With their striking finish and colouring, these monitors will make a visual impact in any studio, but they are not just about looks - the sonics are not too shabby either. These are monitors that, once you've got them sturdily positioned and got yourself familiar with them, will deliver the information needed to get on with the job. What's more, in terms of pricing, not too far north of £400 for a pair of monitors this size is not at all bad.